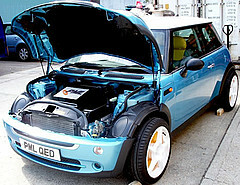 I want an all electric Mini! It’s got 160 horsepower in each wheel and a range of 900 miles, a small gas engine charges it up on long trips. The braking is entirely electromagnetic, friction is so last century. I’m not keen on their choice of color, but if I had the ability to actually aquire such a thing I’m sure I could also spring for a repainting. I do have a few concerns. What’s so “ultra” about the capacitors? I’m suspecious of any person who uses such a prefix, and you should be too. Also, I suspect that the regnerative braking doesn’t quite make you “assured of collecting most of the expended energy when it is time to slow down rapidly.” What sort of efficiency do you get with that anyway? I’m sure those capacitors help, being ultra and all, but hmm…. Whatever, if it works, bring it on!